It’s clearly a rather grand flight of steps, outdoors, in a well-established garden/park area. There’s a large heap of sandbags at the top of the steps. Alongside the steps is what appears to be a rockery of some kind. 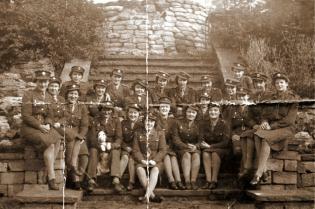 The writing on the back of one of the photos (printed as a postcard) says “Oct 4th 1942, In York”. 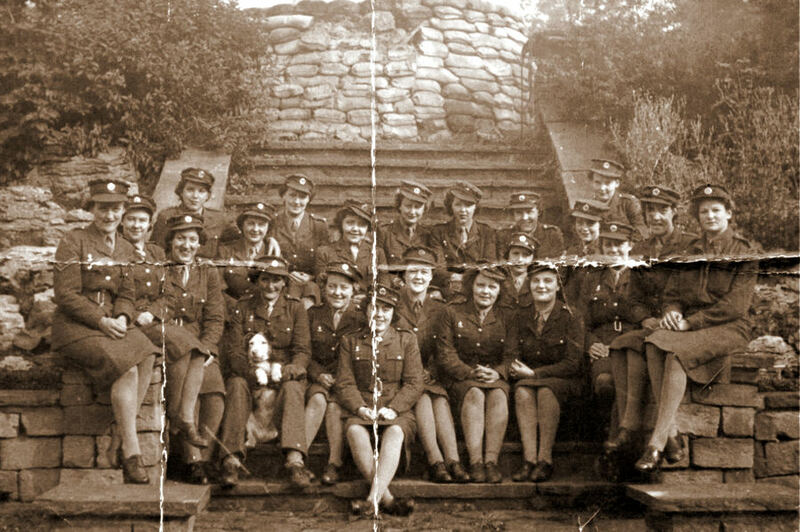 Audrey has mentioned the Prisoner of War camp on the Knavesmire in her memories of York in wartime, and Stephen remembers the ATS girls being stationed on The Mount. I can see from a quick Googling that the ATS personnel were stationed at various places and moved around a lot, but perhaps someone has more information – specific buildings they used? Or perhaps you immediately recognise these rather grand steps? A few days ago a friend suggested that this photo doesn’t look like anywhere in York, and clarified my own vague doubts/queries. He suggested that the geology doesn’t fit – and I can see what he means. It would appear to be a fairly steep bank – and York is, in general, fairly flat. The stone in the background may not be a rockery of some kind, but may be instead part a naturally rocky landscape. Perhaps casting the most doubt on York as a location is the worked stone of the retaining walls – which looks a bit ‘rough’, a bit more like the kind of stone you find out to the west of York. Despite these doubts, I’m leaving it here in case anyone at some point recognises it or can provide any further information. By Lisa @YorkStories • 18 April 2012 WW2 To link to this page's proper location please use the > permalink. Your friend could be right but there is also the possibility that this might be a location that existed in October 1942 but which vanished subsequently. Indeed the writing on the back of the photo actually states “in York” and his mother was an ATS girl who remembers guarding the prisoner of war camp on the Knavesmire. So the location might actually be in York, albeit an historic one, and even in the vicinity where she lived and worked at the time. One location might be the gardens of Nunthorpe Hall which stood on an elevated position overlooking the small Knavesmire and which at one time extended right down to Albemarle Road, as well as bordering the entire length of Philadelphia Terrace. (It is just a proposition but it is likely that ATS girls billeted on the Mount would have walked down Albemarle Road to get to the POW camp on the racecourse). The grounds of Nunthorpe Hall were set to the left of the main building and were on a steep bank (quite unusual for York). A flight of steps down would have been required, likely to have been rather grand, perhaps in the Italian style. Nunthorpe Hall was used as a VDA hospital in WW1 and was even damaged by a bomb from a German Zeppelin in May 1916. It was demolished in 1977 and Coggan Close was built on the area (two blocks where the Hall itself stood and one block at the bottom of the steep bank where the gardens were). This location is, of course, conjectured but it might elicit further debate on the likely location, as well as giving Ian further insight into the surrounding area where the POW camp existed. There is a dearth of photographic evidence of Nunthorpe Hall but here is an aerial view from 1956 which shows the building and grounds in the bottom left hand corner. That does seem like a possibility, David, thank you. I too could only find the one photo online – the aerial view you’ve linked to above. I haven’t been up that way in recent years and don’t know the area very well. This has prompted thought regarding large houses since demolished – another one would be the rather grand Ousecliffe, built on Clifton Scope, near Clifton Bridge. Later known as Government House, since demolished and now the site of Government House Road. A late 19th century plan shows steps up to the house, and the house would have been on a bank/mound, as the new street is now. Unfortunately I’ve no further info on the grounds/gardens, or on what the building was used for in wartime. Just thought it was worth a mention. That ‘rockery’ in the background is still bothering me a bit – is it an artificial construct, if so how common was it to bring in massive pieces of rock to decorate a garden? It’s reminding me a bit of Harlow Carr or somewhere like that. As David mentioned above, Dorothy Thompson of the ATS was one of the casualties on the night of the Baedeker raid. The circumstances of her death are included in the account of the 29 April bombings on this page: http://www.ne-diary.bpears.org.uk/Inc/ISeq_27.html (towards the end of the page). Her death is recorded in the Commonwealth War Graves Commission website – http://www.cwgc.org/search-for-war-dead/casualty/2624204/THOMPSON,%20DOROTHY and also in the book of remembrance currently on display as part of the Baedeker raid exhibition at York Library. That rockery is indeed perplexing, but the answer to this might lie with a business that you have drawn attention to already – the Backhouse nursery at (eventually) Holgate, which positively promoted alpine rock gardening to the well to do grand house owners of York and beyond. In fact Backhouse admired the rock garden so much that the business built their own model rock garden within the Holgate nursery; a very substantial example by all accounts. When I first saw these photos I actually thought they might have been taken within that “model” garden, but would a nursery go as far as to construct those steps within their creation? If they did, then Backhouse nursery could actually be the location that we are after. (The business was in decline by 1942 but a reduced nursery still existed so the date would tally.) However, it is just as likely that the rocks and alpine plants shown in the photograph were sourced by Backhouse and supplied to a grand house like Nunthorpe Hall (which,after all, is only a 15 minute walk from the nursery). I agree it does seem odd to think of an alpine rock garden like this in the middle of York, but when you take into account the existence of the steep bank and the proximity of the Backhouse influence, it starts to make a bit more sense. Could the middle (lighter) section in the aerial photograph be the potential location? Given all of the evidence, it is at least a likely contender, although I do say so quite tentatively. It’s a long shot, but I wonder if the parks and gardens project might have a quick look at the photograph and give an assessment? Was just thinking about this again and started to wonder about the large houses on Mount Vale (Albemarle Road side) which must have substantial real gardens; some of these run down to St James Mount and Trentholme Drive. I’m thinking of the group which includes Trentholme House and the stretch of buildings to the left of that. 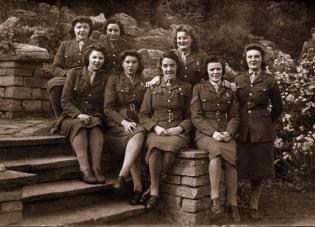 It might just be the large rear garden of one of those, particularly if ATS girls were being billeted in this area. These gardens will dip down a bit, perhaps necessitating some steps, although, again, as with Nunthorpe Hall it is all conjecture. At least these buildings and gardens still exist today, although the format of the gardens could have changed. Perhaps I am restricting the search to too narrow an area (Knavesmire/Mount) when it could easily be elsewhere. At least it gives some ideas, although I realise they might not be any good. Thanks for your considered thoughts on this mysterious location. You’re right of course about Backhouses nursery and their famous rock garden. Perhaps, as you suggest, Parks and Gardens UK would be able to shed some light on it. I don’t know if Ian has called back to read the comments. The other major query, of course, is what that massive pile of sandbags is doing there – protecting something, presumably? But looking beyond it, though only a tiny part of the wider view is visible, there’s no obvious sign of a building, only what seems to be another tree, some distance back. There are a couple of books I can think of that might help – will search them out in the library when I’m next up there. There really are a lot of sandbags in that stack, understandable perhaps given the raid only six months before. And I suppose grand homes and gardens also incorporated large amounts of glass, paticularly if they had botanical hot houses (Nunthorpe Hall certainly had one of these at the back). Hopefully Ian has been back to read the very quickly constructed ramblings. I am only sorry that they are complete guesses and not a confirmed location. Gardens can sometimes be difficult to track down; the main buildings can endure but grounds can be redesigned or simply sold off and built over. I am thinking of Elm Bank on Mount Vale as just one nearby example. It once had quite large grounds, with its own fish pond, but whilst the main house (now Hotel) still exists most of the land was given over to provide housing. Thanks for the links to the photos. Impressive creations! Interesting information regarding Elm Bank too. Many of these larger dwellings ended up selling much of their land for housing development, didn’t they. I like the Nunthorpe Hall suggestion, and can see what you mean regarding the aerial photo and possible steps. Would be interesting to see if there’s any information available at the York Explore library, either in the lending or reference books. One that comes to mind is ‘Lost houses of York and the North Riding’ by Edward Waterson. I used to live at nunthorpe hall in the early 1970s. The family who owned it lived in the front part of the house and tenants in the rest. I recognise the steps in the photos which led one down into the gardens and what was an old tennis court. I recall the stone as being dark in colour, and not of the yellow stone of the locality. I, therefore, think the photos are in fact those of nunthorpe hall. Hope this helps clarify the matter. Really nice to have this information, after our discussion above. Thanks Delice. I’ll email Ian who sent me the photo. Hope David still visits these pages and sees your comment too, as he originally suggested Nunthorpe Hall. Thanks everyone for your help. Delice! I remember living in Nunthorpe Hall in 1971-2 when you were in the flat upstairs. We lived in a ground floor annexe which I believe was originally for servants. I actually don’t recognise the steep flight of steps in the photo at all. To my recollection there was a flat grassy area behind the house (the old tennis court?) which led slightly downhill to overgrown kitchen gardens. I do remember a steep tarmac drive which went down past a ‘moongate’ overlooking allotments and joined Albemarle Road. That leads me to believe that the grounds of the hall were largely flat and the rise from Albemarle Road was taken up by the houses on that road. I read this correspondence (rather belatedly!) with great interest as I live in one of the 1939 semis on Albemarle Road which was presumably built in the part of the grounds of Nunthorpe Hall. I also belong to Clements Hall Local History Group which covers this area – you might be interested in the following piece written by one of our members. I am particularly interested in the “moongate” as the bungalow at the top of the slope several doors down bears this name. The wall of the hall which now border the allotments have large bricked up round “windows” in them – would the moongate have looked like those? Did it actually face onto the road? Any information gratefully received! Anne, I used to have a lovely photo looking out through one of the moongates over the allotments (not a road) from the drive up to the rear of Nunthorpe Hall from Albemarle Road. I’ve had a look but can’t put my hand on it at the moment. If I find it, I will post it. The views were beautiful. I used to push my baby in her (old-style Silver Cross) pram up and down that steep drive most days. I remember the older couple who lived in the house next to the drive (called ‘Moongates’) were incredibly nice and very kind to an impoverished young family, often offering us their old furniture etc. It was a great period of my life, and I was very sad the first time I went back to York and found that the Hall had gone. 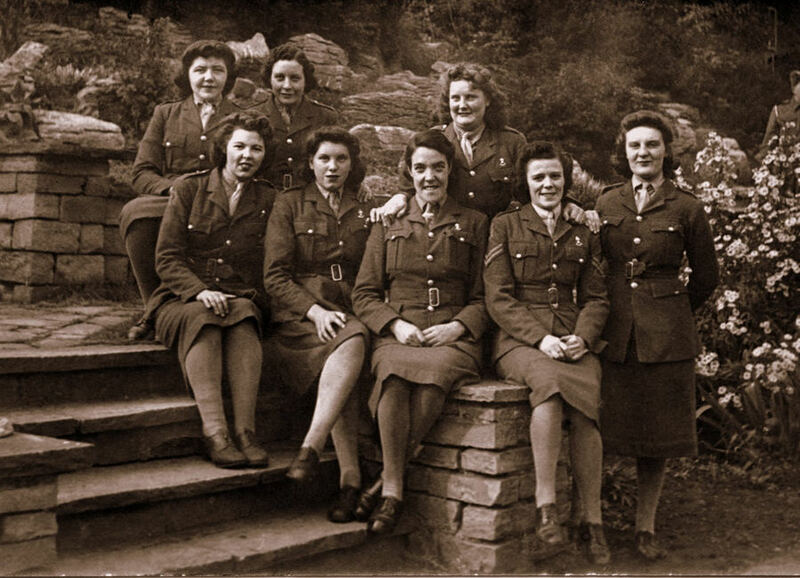 I am looking for information on Middlethorpe Lodge, as my Mum who was born in 1937 lived at the Lodge, with her 9 siblings, during World War 2 as my Grandad was the Caretaker at the time. His name was Edgar James and my Mums name was Rena May. Hi Susie, done a bit of digging on Middlethorpe Lodge. There’s very little info available online as the Lodge was demolished in the 1930s – presumably after your mum and granddad had moved on. The only possible photograph seems to be a cabinet card which is held by the National Library of Ireland. I say possible as the description in their catalogue is a little vague and mentions ‘Lady Grant Lawson, Middlethorpe Lodge on horse:’ it may of her seated on a horse outside the Lodge or it may just be a reference to where she lived. It might be worth your while contacting them and asking if there’s any chance of viewing without having to travel to Dublin. There’s also a very brief mention of the Lodge on the site below but only to distinguish it from Middlethorpe Grange which was a completely different building. York Civic Trust produced a leaflet on Dringhouses which includes a small map containing Middlethorpe Lodge. It’s a PDF file which you can download from the link below. Mike, thanks for all your research on this, sorry for the lack of response. Will try to contact Susie if she provided an email address with the comment. Really thankful Mike for all this work . I am a little perplexed as my Mum was born in 1937 but she lived in the Lodge. But the dates dobt correlate.